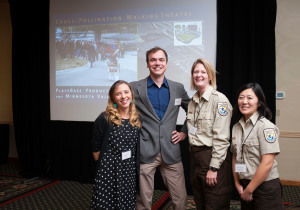 On June 6th and 7th, 2015, as part of the Twin Cities Urban Bird Festival, PlaceBase Productions presented After the Birds Taught Me to Fly: Bird-Watching Theatre at the Minnesota Valley National Wildlife Refuge! Audiences followed Ranger guides on a trail-hike to visit four flocks of Refuge birds and observe their behavior through the eyes and imagination of an eight-year old bird-watcher. 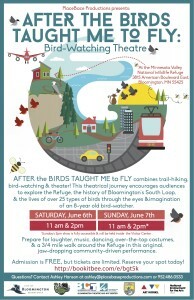 Over the course of this theatrical journey audiences explored the Refuge, the history of Bloomington’s South Loop, and the lives and behaviors of over 25 of the Refuge’s feathered friends. There was laughter, music, dancing, over-the-top costumes, and a 3/4 mile walk on the Refuge trails in this original, jaw dropping community-driven performance. We did also present one show that was fully accessible to wheelchairs and strollers on Sunday, June 7th at 2:00pm inside the visitor center. Click HERE for an analysis our audience’s experience of the play. PlaceBase Productions was selected by the City of Bloomington and the Bloomington Theatre and Art Center to create a new play at the Minnesota Valley National Wildlife Refuge in the Bloomington South Loop neighborhood. There in the picture is Ashley and Andrew with MVNWR Rangers Mara and Sarah. From among 15 finalists PlaceBase was selected along with three other exciting projects as part of a larger initiative called Creative Placemaking in the South Loop–made possible by an Our Town grant from the National Endowment for the Humanities. In January, February and March PlaceBase hosted 4 story swap workshops at the Wildlife Refuge. We met with neighbors, staff, lovers of the Refuge, Bloomington historians, Dakota scholars, and a host of artists who hope to be involved in the upcoming theatre production at the Refuge. This production will be an exuberant celebration of the River Valley, the Wildlife Refuge and Bloomington’s South Loop. We can be sure the neighborhood will never be the same again. 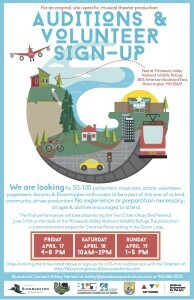 We held Auditions and Volunteer Sign-up on April 17, 18 and 19 at the Minnesota Valley National Wildlife Refuge. See the poster below.